We focus on original games that help people share and build energizing, supportive relationships – friends, couples, family members, neighbors, communities, coworkers, teams, teachers and students, patients and healers. Games give people a way to do serious things without taking them seriously. 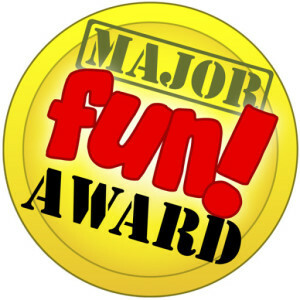 The Major Fun Award is the primary award level. Games and toys that receive this award have proven themselves to be adaptable, enjoyable, quality products that make our world a better place. 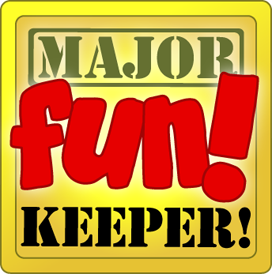 The Keeper Award is given to those games found to be especially successful in helping people practice principles of playfulness. 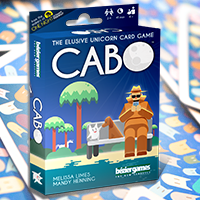 These games have already shown themselves to be Major Fun, but also prove to be exceptionally flexible, easy to learn, and easy to adapt to a wide range of audiences and play styles. 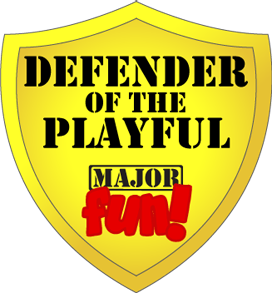 The Defender of the Playful Award is a recognition given to other people who have created something valuable, and meaningfully fun, have demonstrated a passion for playfulness, and have somehow been able to make it available to a wide range of audiences. There are no fees for the Major Fun award. The award is recognized worldwide as an independent seal of quality and fun! Major Fun winners are licensed to use the Major Fun Award logo with that product – on the package, in print, and associated media. Your games promote fun and play and joy, and the Major Fun Award exists to honor the games that are most effective at bringing these qualities out in our communities. Please know that your work is deeply appreciated and we are thankful you chose to share it with us. When we receive your games, they go into our playtesting queue. There are literally hundreds of games in the queue at any one time, so it can take time for us to play everything that is submitted. A game moves up through the queue until we play the game and evaluate it with a very basic rubric: is it easy to learn? Does it appeal to a wide audience? Do you want to keep playing? What makes it stand out from other games? And, most important of all, is it fun? Fun is the ultimate test. We realize and appreciate that fun comes in many forms from the silly frantic fun of kids or party games to the brain burning challenges of heavier strategy games (these games are considereed for The Spiel of Approval Award) and everything in between. When we play a game for the first time, the games we really don’t want to stop playing, the ones we want to play again, become candidates for a Major Fun Award. The process is informal, but it’s fun and surprisingly accurate. 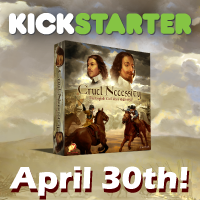 I want you to know basic information about the game (concept, components, mechanics). I also want you to know what sets the game apart from others. Only then can I give you a sense of why I enjoy the game and what kinds of players might enjoy it as well. From there, I trust you can make your own informed decision about whether this is a game that might speak to you. 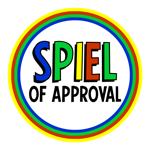 Games that win the award receive a full audio or written review by Major Fun posted here on the site. Major Fun will contact each publisher that wins the award. We don’t like every game we play. But we do like every game we review. There are no negative reviews. So, if you submit a game and it doesn’t win the award, it’s because we felt it did not meet at least one of of the Major Fun criteria. Please Note: because of the large volume of game submissions, we cannot respond in detail to every publisher who submits a game for consideration. 1) Step 1: Produce some handmade copies. 2) Step 2: After Bernie’s blog post sells out my initial set, I’m tired of making them by hand. 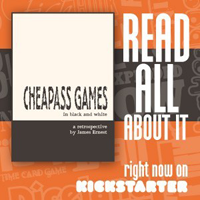 New World Games helps me make 250 really cheap, but slightly better copies. 3) Step 3: The game is picked by Games Magazine for their top 100 of 2004. New World Games prints a nicer edition. 4) Many years later Tim Walsh (creator of Blurt and Tri-Bond) comes across one of those and asks Mike Petty if he can pitch the game to some companies. 5) Find It Games takes it on as their first move toward party games. They change it to Oh, Really. So thanks for your help six or seven years back!.